One section each day comes on stage for the Prayer song and Hindi and English songs are alternated between every day. This is also the time to felicitate award winners and participants in various fields. Pre-Primary up to Grade 1 has assembly twice a week. The mentors lead the songs and prayer, however 4-5 scholars address the Assembly on pre-prepared topics. This is to enhance their communication skills and also give them more exposure to public speaking and being on stage. We mark all festivals in Junior School and different grades are given the responsibility of the same. Scholars and mentors plan for the Special assembly and present it before the entire Junior School. This assembly is generally 30-40 minutes long and the all the scholars are encouraged to participate in it. We also have special assemblies put together by different sections and parents of those sections are invited to a special viewing. Gathering and interaction of mentors and scholars is paramount for a collective interaction in a formal setting. Scholars from grades 6 to 12 along with the mentors assemble in the Multipurpose Hall to achieve the following goals. i. To develop a feeling of affiliation and unity among the scholars. ii. To acquaint scholars with the school programme more clearly. iii. To develop in scholars a sense of identity with the school. iv. To enable students to share their experiences, stories, anecdotes with others. v. To provide them training in good social behaviour desired in public life. vi. To motivate scholars by positive reinforcement in the form of praise or rewards awarded in public. vii. To celebrate national festivals, Independence Day, Republic Day, birth days of great leaders and so on. These leaders could be political leaders, scientists, poets, writers and so on. viii. To facilitate moral and religious development of scholars. ix. To facilitate national integration and secularism through all-religion prayer meetings among scholars. On Mondays the School has a combined assembly both for the Middle and Senior school in the Multi- Purpose Hall. Here the scholars read out a prayer, thought of the day and news. This is followed by the prayer song by the school choir. Thereafter important announcements are made and on most occasions the Principal addresses the school on important issues of concern. Medals or prizes, if any, for Inter House and Inter School achievements are also given out in the morning assembly. Finally the Assembly is dispersed after the National Anthem. On Tuesdays the Middle and Senior school have Sports assembly where sports related issues are addressed. Sports medals are also given to scholars to acknowledge their sporting excellence. On Thursdays the Middle and Senior school have a class or a contemplation assembly. A contemplation assembly is where a mentor addresses the scholars giving a talk or presentation on a didactic, informative or inspiring theme. A special class assembly is an opportunity given to every class to present an assembly on any interesting theme. 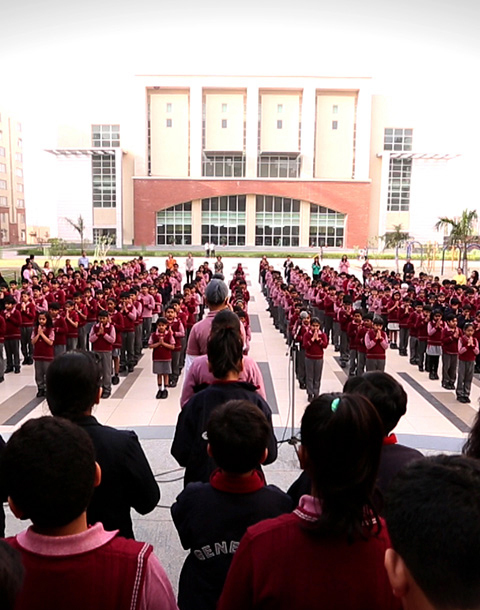 On Fridays the School has House Assemblies wherein different houses are addressed by their respective Housemasters at different allotted venues. These House Assemblies help in creating house spirit and foster healthy competition amongst different houses.